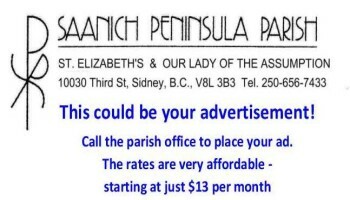 URGENT CALL FOR CATECHISTS !!! Carla & Jim Fretwell are unable to lead this year’s sacramental prep program due to their daughter Wendy’s critical illness (please keep the family in your prayers). In addition, Stasia Hartley is not available this fall. If you think that you can help, please contact Father Rolf at 250-656-7433. K of C PANCAKE BREAKFAST: SEPT. 30 $6 / person, 12 & under free. Good food & fellowship. Bring your appetite! THANK YOU! “The Lally family is very grateful to St. Elizabeth’s for the wonderful tributes and generosity you have displayed! Yes, God is Love and you will always have a special place in our sacramental life! Love and God bless!” - The Lally family. WEDDING ANNIVERSARY We want to extend a blessing and very special congratulations to Alice and Stann Hall who are celebrating their 75th wedding anniversary on August 20th. Due to health challenges they are now unable to attend the 10:30 mass. Happy Anniversary! OFFICE ANNOUNCEMENT Gary Koett will be retiring Sept. 30th., 2018. We thank him for nearly 10 years of serving the parish in the office. PRAYER FOR THE CHRISTIANS OF THE MIDDLE EAST Let us heed Pope Francis’ plea for prayer to be offered for the Christian communities of the Middle East as well as for all those who continue to be affected by the conflicts in the world. Bishop Gary Gordon invites you to the Ordination to the Order of Deacon of: John Dawson, Dion Pomponio, Michael Watkins, Philip Yuson on Sat. July 28, 2018 at 10:30 am at St. Andrew’s. These men have spent 4½ years in prayerful discernment, study and ministry. We wish them and their families God’s blessings. Reception at St. Patrick’s after. CANNING JAR RETURNS To prepare for the jelly making from the rectory grape vines, please return jars from last fall’s sale so that they can be used for this year’s harvest. All proceeds go to sponsor students in Mindanao, Philippines. Thanks to Julie and Larry Kirzinger who devote so much time to harvesting and making the jelly. DIOCESAN FAMILY CONFERENCE Families across the diocese will gather together for a fun, faith filled weekend of fellowship, play and prayer time all set against a beautiful West Coast backdrop for the Sixth Annual Diocesan Family Conference. Join us! August 23-26, 2018 at Nanoose Bay Camp. Everyone welcome! For registration go to tinyurl.com/Diocesan-Family-Conference. For info email Reine at: familycamp@rcdvictoria.org or visit www.rcdvictoria.org. EXECUTIVE DIRECTOR FOR THE SISTERS OF ST. ANN See posting on bulletin board. Fr. Jack’s funeral mass will be held on Fri. Apr. 8 at St. Elizabeth’s.